Traditional meat and potatoes fare in the heart of Santa Barbara cowboy country. : When brothers Jeff and Matt Nichols took over Red Barn in Santa Ynez, long a locals' favorite watering hole, they elevated the place entirely. The interior is hip and sleek but comfortably rustic without being stuffy, with an open kitchen, an updated bar, wood tones and white tablecloths. 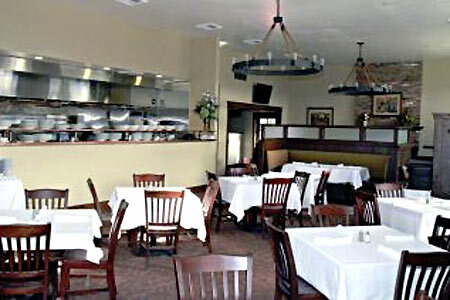 The menu is very traditional and also familiar, with mesquite wood-grilled steaks and chops. You’ll find dishes like a vegetable spring roll with spicy mango sauce, and a baby greens salad with Stilton, poached pears and candied walnuts. But most folks come to Red Barn for meat, such as the slow-roasted prime rib --- a tender, sizable slab served with garlic mashed potatoes and a straightforward jus. If that’s too heavy, consider the roasted chicken breast stuffed with herbed goat cheese, plated with mashed potatoes and a thick herb sauce. But save room for the mud pie, the staple dessert: an Oreo cookie crust holds house-made coffee ice cream that’s topped with whipped cream, chocolate shavings, caramel sauce and whole pecans.